Annville, Pa. – Lebanon Valley College junior Sam Light missed a free throw with 0.2 seconds left and Alvernia University (11-7, 5-4) survived with a 60-59 victory over the Dutchmen (11-17, 5-4) on Saturday, Jan 21 in MAC Commonwealth men’s basketball action at Sorrentino Gymnasium. Alvernia junior Mike Miller, Jr. missed the second of two free throws on the other end with three seconds left and fouled Light on a reach-in as he crossed mid court. Light hit the first free throw to pull the Dutchmen within one, but was short on the second attempt that would have tied the game. Alvernia junior Alex Shippen knocked down a 3 with 5:59 left that gave the Crusaders a 54-49 lead. The guests went 0-for-4 from the floor and missed four free throws from there. Lebanon Valley scored six straight points after the Shippen 3 to take a 55-54 lead, but from there it was a free throw contest both ways. Alvernia sophomore George Williams was fouled with seven seconds left and hit two free throws to give the Crusaders a 59-56 lead. The Dutchmen pushed the ball up court with Light and chose not to attempt a potential game-tying 3, but instead went to the basket. Light got into the lane and was fouled by Marshall–his fifth of the game. Light hit both free throws to pull within one then LVC fouled Miller, Jr. on the inbounds pass before his 1-of-2. Marshall posted his seventh double-double of the season with game highs in points (18) and rebounds (12). Miller, Jr. had 13 points and Williams finished with a dozen. LVC got 17 points from Light and 14 from Andy Orr. Alvernia built it’s largest lead of the game when a dunk from Marshall put the Crusaders up 26-17 with just under five minutes left in the first half. That lead evaporated quickly with the Dutchmen scored 12 straight points for a 29-26 lead with 46 seconds left in the half. Miller, Jr. hit a 3 for the Crusaders to tie the game with 24 seconds on the clock and Light knocked down a 3 for a 32-29 LVC lead on the final play of the first half. LVC held a 47-44 led midway through the second half before a 3 from Marshall started a 10-2 run that gave the Crusaders the late 5-point edge. Alvernia picks up an important road win in the league and jumps into a 4-way tie for second place at 5-4. Lycoming is 8-1 through the first nine games–its only loss to LVC–and has a three game lead over Alvernia, Hood, LVC, and Albright. Arcadia (4-5) kept pace with a 12-point win over Stevenson, as did Widener (4-5) with an overtime win over Albright. 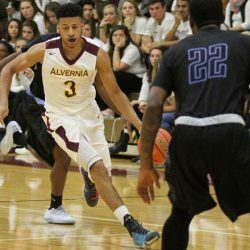 Alvernia hosts Hood on Wednesday and has the league bye next Saturday (Jan. 28).